New Castleford Tigers under 19s assistant coach Paul Couch. Castleford Tigers have strengthened their coaching team at youth level with the appointment of local coach Paul Couch as their new under 19s assistant coach. Couch will help under 19s head coach Ryan Sheridan and assistant Tony (Casper) Smith with every aspect of the team, but his main duties will include helping with training and assisting the team on match day. The long time Lock Lane coach is excited to start this new chapter in his coaching career. He said: “It is a great opportunity to come down to Castleford Tigers and coach the youngsters. “I’m a lifelong Tigers fan and I’m really excited to get started on preparation for the new season and I hope the boys are too. 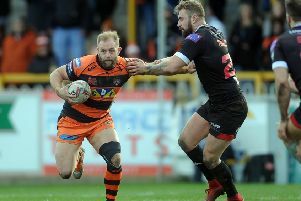 Couch has been with Castleford Lock Lane in one role or another for the last 20 years and he is grateful for the junior club giving him a chance. “It’s a great club with great people,” he said. The Tigers under 19s will not be Couch’s most important job at the moment, as he gets ready to jet out to South Africa with the England Community Lions under 19s. He added: “The chance to be head coach of the Community Lions under 19s came around pretty quickly and we’re flying out to South Africa this weekend. Tigers head of youth Pete Riding is really happy to welcome Paul to the coaching team. He said: “I am delighted that Paul will be returning to the club after having worked on the club’s scholarship programme a number of years ago.